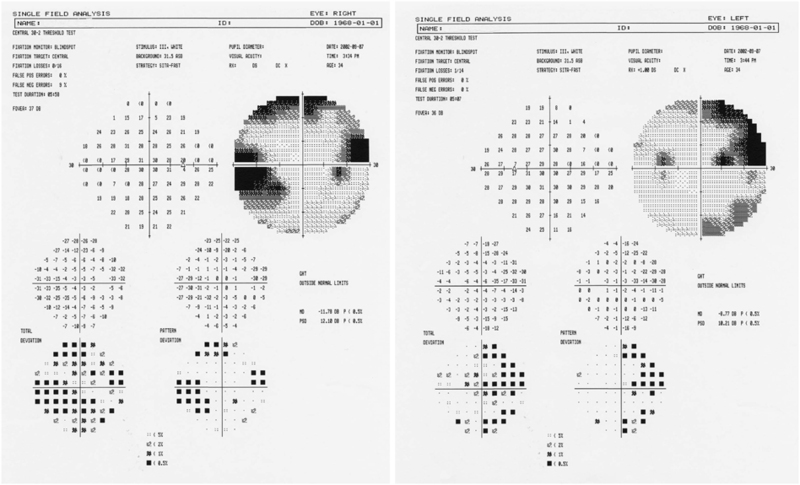 Humphrey visual field is an automated perimetry vision test where repeated light stimulus of varying intensities appear within the machine. It is a simple and non-invasive procedure and takes only about 15 minutes. The patient is required to focus on a fixation light located centrally within the machine. As each light flashes at different intensities in the patients peripheral vision, they must indicate when these lights are visible by pressing an indicator button. The results obtained from the patient are then compared with those of the normative age database. This test is invaluable in diagnosing, and monitoring the treatment in patients with glaucoma. A patient typically requires multiple sittings of this investigation over a period of time to monitor the progression of the disease. It is also useful in certain neurological conditions and in some conditions affecting the optic nerve of the eye. Optical Coherence Tomography (OCT) is a noninvasive, non-contact, transpupillary imaging technology which Cross-sectional images of the retina and optic nerve head. These images are produced using the optical back-scattering of light in a fashion similar to B-scan ultrasonography. 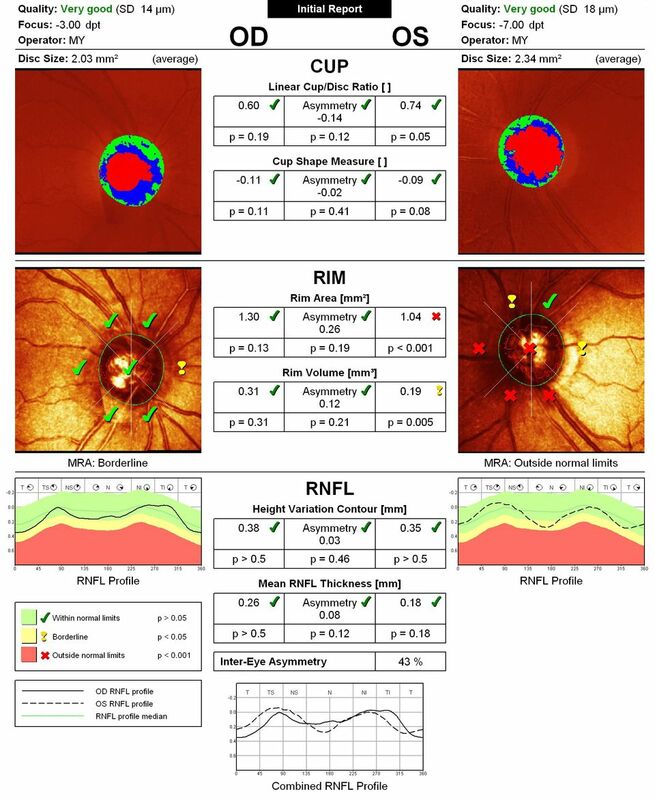 OCT has the capability of measuring the retinal nerve fiber layer thickness in glaucoma and other diseases of the optic nerve. The nerve fibre layer thickness values are compared to a normative database based on age, gender and nationality. This test is performed routinely and each test can be compared with the previous tests to determine progression over time. Heidlberg Retinal Tomography has been proven to be superior to all other available optic nerve imaging techniques, and uses the latest in scanning laser technology for early detection and follow up of glaucoma. This machine is a laser ophthalmoscope, which can precisely measure and analyze the shape of the optic nerve. The HRT is not a treatment laser, and is not harmful to the eye. Data from successive HRT exams is superimposed on the original data (or baseline exam) for a point-by-point comparison to identify changes over time. 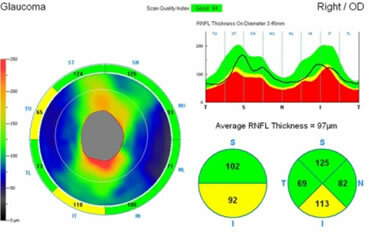 Therefore, repeated measurements of the optic nerve using the HRT can pick up glaucoma damage up to six years earlier than visual field testing alone. By performing these state of the art imaging tests in Toronto, Dr. Skouras is able to distinguish when treatment is necessary or when treatment should be modified. Visual Field, OCT and HRT tests are noninvasive and safe diagnostic scans that take moments to complete by our certified technicians. The frequency of follow ups is determined by Dr. Skouras and based on whether the progression of glaucoma is stable or aggressive.